PHILADELPHIA, PA – In a way, it’s hilarious. 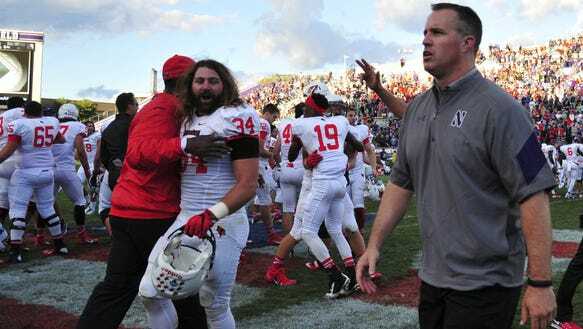 This weekend, relatively quietly, two more teams of the FCS played, and beat, FBS schools. Granted, the Huskies of Northern Illinois are struggling, at 0-4 competing in the MAC. But the Huskies still were in one of the biggest bowls in college football -the Orange Bowl – back in 2012. And entering this season, they were near-unbeatable at home in Huskie Stadium. And this weekend, a tiny in-state FCS school named Western Illinois, beat them 28-23. Sure, Arkansas State is struggling, at 0-4 competing in the Sun Belt Conference. But they have been a regular participant in bowls in the last five years running, and this weekend, a tiny in-state FCS school named Central Arkansas beat them 28-23. These wins weren’t outliers in any way, shape or form. They were the 9th and 10th wins, respectively, by FCS schools over FBS schools. And it’s at this precise moment in history when the justification Jim Delany’s laughable agreement, negotiated with the athletic directors of all the Big Ten schools to stop scheduling FCS schools, came apart. What must have gone through Delany’s mind, then, when North Dakota State’s win over Iowa generated a Kinnick Stadium sellout – 70.858 fannies in the seats – and a prime slot on ESPN2? That’s not the only case of equal or greater attendance at home with FCS games, either. In Northern Illinois’ two home games this year, the game against FCS Western Illinois (15,496) outdrew the one against FBS San Diego State (14,513). The same thing happened with Arkansas State: their season opener versus Toledo (26,182) was out-performed by the attendance of the Central Arkansas game (28,012). You say that’s small potatoes? Consider Syracuse’s game against FCS Colgate, when, where the attendance of that contest (31,336) was shockingly close to the Orange attendance the following week when they hosted national championship-contending Louisville (32,184). So considering that evidence, what did a Big Ten athletic director say about the decision more recently? “Strengthen the schedule?” Delany and Barta might want to take a peek at the latest Sagarin ratings, where North Dakota State at No. 50 is literally ranked above half the teams in the Big Ten. One of those teams ranked below the Bison, Northwestern, were also upended by an FCS team, Illinois State, 9-7, meaning the battle this weekend between Iowa and Northwestern now isn’t simply a Big Ten conference matchup – it’s also a consolation game between Big Ten teams that couldn’t beat FCS teams from the Missouri Valley Football Conference. Four Missouri Valley football teams sit in front of the lowest-ranked Big Ten team in Sagarin, which is Rutgers. How can anyone with a straight face now get up in front of a microphone and claim that scheduling a football game versus an opponent like North Dakota State or Illinois State “weakens our schedules”, when in reality, a conference game versus Rutgers is more of a strength of schedule drain than the Bison – by a very large margin? For sure, not every FCS versus FBS matchup is going to be an epic upset or a win against a team that finds itself in the Sagarin Top 100. There are games that are epic mismatches, like Missouri’s 79-0 win over Delaware State, for example, after ending the first quarter up by 30. But epic mismatches don’t only involve FCS teams, either. Alabama shut out Kent State 48-0 in a game that wasn’t nearly as close as the final score indicated, either, and nobody in the SEC is trying to outlaw “unexciting” games against MAC schools. How can someone say that FBS teams are always better than FCS teams, when there are so many examples of FBS teams not only getting beaten by FCS teams, but out-muscled and blow out by FCS teams, too? Virginia may be an ACC team, but an FCS school, Richmond, not only beat this so-called “Power Five” school, but nearly doubled them up, 37-20, dominating the Cavaliers in every phase of the game. North Dakota State’s and Illinois State’s conferencemate, Northern Iowa, didn’t wilt in front of Iowa State’s 85 scholarships or Big 12 membership – they simply got the ball back with an interception, and ran for five straight plays on offense against Iowa State’s supposedly superior conditioned defensive line. And guess what? They got the game-winning touchdown in a 25-20 “upset”. Delany and the Big Ten athletic directors seem to want college football fans to trust them over their lyin’ eyes. Do they think college football fans these days are blind to the fact that Eastern Washington, North Carolina A&T, Eastern Illinois and Albany all beat FBS teams? The truth is not all FCS teams are created equal, but it’s also pretty much now a given that the best FCS programs can compete on any given Saturday with any FBS programs. Are they harboring some sort of illusion that FCS teams like North Dakota State aren’t “exciting” enough? The truth is the Bison played in front of a packed house and brought 10,000 of their own amazing fans to Kinnick Stadium, which made for a tremendous gameday experience and a competitive football game against a strong team – one that played very well on ESPN. The Bison are also no strangers to ESPN in the last three years, having hosted ESPN’s Gameday program twice, and been featured in two FCS Kickoff Classics in the last two years on ESPN. Oh yeah, there’s also that five straight FCS National Championships, too, also on ESPN. 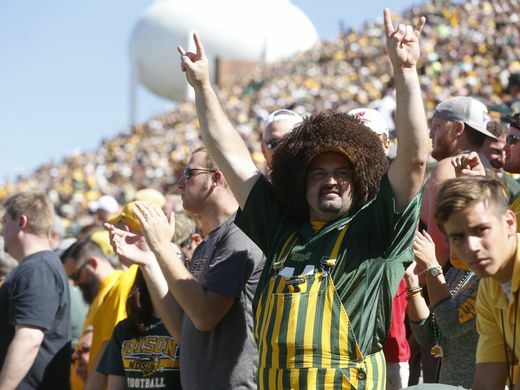 Make no mistake: the Bison have genuine star power that draws in the curious college football fan. Maybe they were obscure years ago, when they were upsetting Kansas State in Friday primetime a few years ago, but they’re not obscure anymore. Are they deluded enough to think that the FCS doesn’t have star power? The truth is, there’s no escaping North Dakota State’s star power now that former Bison QB Carson Wentz is leading the Philadelphia Eagles to a 3-0 record as a rookie. Certainly Carson Wentz had his share of detractors when he was taken No. 2 in the NFL draft back in April. Many scoffed, too, when he was by default named the Eagles starter. But he won his first football game, and now, at 3-0 and a stunning, dominating performance this weekend over the Pittsburgh Steelers, it’s impossible to ignore that any critics were wrong: Wentz can play. He won’t go 162-0 as a starter in the NFL, but he can play. Of course, Wentz is hardly the only NFL pro that has cut his teeth in the FCS. Super Bowl winner Joe Flacco, who went to Delaware, is still leading the Baltimore Ravens to victories on Sunday, handing the ball off to running back Terrance West, another FCS alum from Towson. It’s relevant to the Big Ten’s playoff ban, too, since with the rise of Wentz, Flacco, West, and so many other football players now seen every Sunday by fans of the NFL, the Big Ten’s ban on playing teams like North Dakota State really and truly falls apart. FCS teams aren’t talented enough? Flacco. 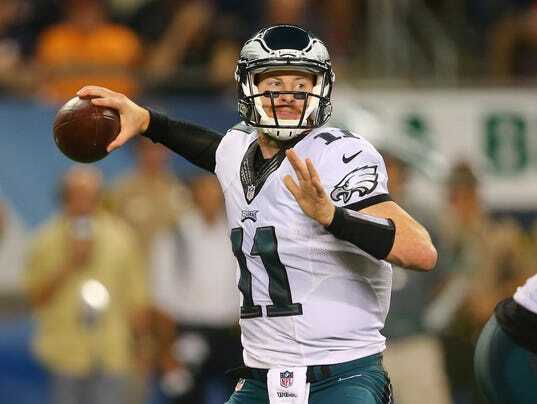 Wentz. Uncompetitive matchups? Ten wins this season versus FBS teams, and counting. FCS teams can’t draw? Iowa. Northern Illinois. Arkansas State. Unexciting matchups? ESPN2. Sellouts. Close David vs. Goliath games. All that’s really left to do is ask Delany and Big Ten athletic directors once again – what are you asking us to believe, you or what every living, breathing football fan has been seeing week after week this football season?